The Receptor lets you use VST plug-ins without a computer. How does V2 improve on the original? Anyone who has ever relied on a computer at a live gig will know that sick feeling you get if it crashes, temporarily loses the connection to a USB/Firewire audio interface, or its hard drives throw a wobbly due to stage vibration or the accidental knock. Having to reboot a computer during a gig while getting dark looks from fellow band members is never a pleasant experience, so many musicians refuse to bite the bullet and instead stick to playing hardware synths that always last the course. It's no wonder, then, that the Muse Research Receptor has proved so popular with musicians who want to run lots of software synths live. Although still essentially a PC, in a smart yet roadworthy rackmountable case, that runs your choice of VST Instruments and effects, it's also a self‑contained device designed from the ground up to behave almost exactly like a hardware synth module. It offers 'whisper‑quiet' operation, rock‑solid performance at very low latency, and excellent audio quality, courtesy of its integral 24‑bit/96kHz audio interface. Connecting a monitor to the rack unit gives access to a graphical mixer interface allowing you to set up and control your chosen plug-ins. Moreover, by avoiding the excesses of Windows in favour of a streamlined 'Muse‑Machine' version of the Linux operating system, even if the worst ever happens and someone pulls out your mains cable, the Receptor only takes seconds to reboot to its auto‑saved previous state, compared with the minute or more taken by many PCs to simply arrive at the desktop. And, as PC hardware gets ever faster, it can evolve with the times. The distinctive, 2U, metallic blue and black front panel and green LCD display of the original Receptor is now instantly recognisable, but the revamped deeper blue of the Receptor 2 panel and blue‑lit display looks rather more sophisticated. We've got the more powerful Receptor 2 Pro Max model for review and, ironically, it looks rather more anonymous in its gunmetal-grey livery. However, the main difference across the new range is what's inside. While the original Receptor housed a single‑core AMD Turion processor running at 1.8GHz, a 160GB hard drive, and a maximum of 2GB RAM, all Receptor 2 models now have 4GB RAM installed, which is a welcome improvement to cope with combinations of larger modern sample‑based instruments. The standard Receptor 2 models now offers significantly more processing power, courtesy of an AMD Athlon II dual‑core CPU running at 2.8GHz and a 320GB internal hard drive, while the Pro model has an Intel Core 2 Duo 2.53GHz processor and 750GB hard drive, and the Pro Max extends hard drive storage to 1000GB and the dual‑core processor speed to 3GHz. There have been no fundamental changes to the feature set, although the PS/2 keyboard/mouse sockets have been replaced by extra USB ports, and there's now a DVI socket alongside the original VGA monitor connector. You still get a single stereo input and output, S/PDIF In/Out and an ADAT out for those needing more mixing flexibility. As well as the kind of audio I/O sockets you'd expect to find on a synth, the Receptor's back panel also features an area dedicated to PC-type connections. Both Pro models also offer an eSATA port for future external drive expansion, and (most significant of all in my opinion) the option of internal 128GB or 256GB SSD (Solid State Drive) storage. With sustained transfer rates double that of most SATA hard drives, these are a much better way to increase the maximum polyphony, for those that need it, than simply installing lots more system RAM. Even better, being solid state means that SSDs are impervious to shock and vibration, making them the perfect storage medium for the gigging musician. The unit under review here is the top‑of‑the‑line Pro Max model fitted with a 256GB SSD. I must admit to being slightly disappointed when I first switched on, as my definition of whisper‑quiet is obviously slightly different from that of Muse Research. Despite the lack of normal hard drives, the acoustic noise levels of the CPU and case fan remains higher than those of many specialist PCs that I've reviewed over the years. Although irrelevant in a gigging context, this fan noise might be slightly intrusive for desktop use in the studio, but should reduce considerably once the Receptor 2 is bolted into a rack. However, I was well impressed by the roadworthiness of the insides. This unit is most definitely going to last to the end of the tour! The Receptor Remote Viewer looks identical to the virtual mixing desk run inside Receptor, but is conveniently run from the comfort of your own computer. We covered the Receptor controls and virtual 16‑channel mixing software in some detail in our original review in the March 2005 edition of SOS, so if you want to revisit their operation I suggest you read the on‑line version (/sos/mar05/articles/muse.htm). Muse Research got things right first time around, and I noticed very few software changes for this version. You can plug a MIDI keyboard controller into the Receptor's MIDI input or USB port and its audio outputs into your amp, and use it exactly like a hardware synth. This proved to be simplicity itself, using the front-panel Bank/Patch controls to select synths/sounds, as did processing vocals or guitar plugged into the Receptor line inputs, and latency is, indeed, very low, with buffer settings available down to 32 samples at 44.1kHz (a tiny 0.7ms), while audio quality is subjectively excellent. Plugging in a computer monitor makes operation even easier, using the familiar‑looking mixing console software, and since I was lucky enough to receive a unit already fully stuffed with instrument and effect goodies, I can also confirm that the Receptor 2 works well with favourites such as NI's Reaktor/Massive and Spectrasonics' Omnisphere, among many others. I loaded up all 16 MIDI channels with different VST synths and there was plenty of processing power available, although I did find Omnisphere rather sluggish while loading new patches. 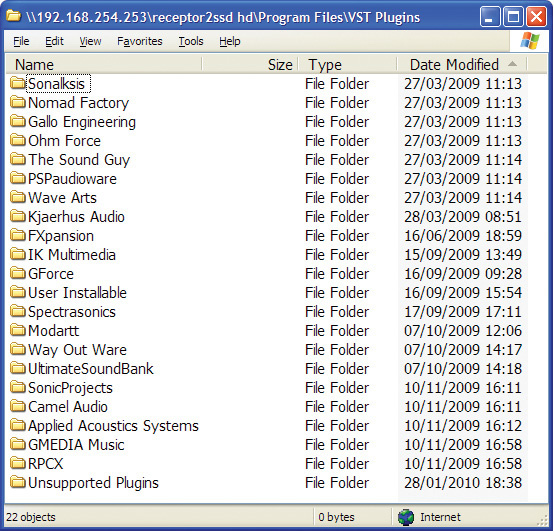 Using the Receptor Tools and Uniwire connection, the Receptor 2 appears on your own computer as a remote drive for easy installation of your own VST plug‑ins in the familiar vstplugins folder. You will need to connect the Receptor's Uniwire network socket on its rear panel via an Ethernet cable to a Mac or PC to transfer across your own VST Instruments and effects, but this also enables you to run the mixing console from the comfort of your own machine. Uniwire has been beefed up considerably in the Receptor 2, offering 10 times the networking speed for much faster installation of larger libraries. The increase in speed also makes it easier to abandon the Receptor MIDI and audio connections and send all your data via Ethernet cables, so you can control multiple Receptors via an Ethernet switcher from a laptop‑based sequencer, sending the final audio data-streams directly back to your computer. I initially found it quite difficult to make up my mind about the Receptor 2. You have to praise Muse Research for almost single‑handedly creating a rugged and reliable '2U gigging PC' that you can effectively treat as a hardware synth. The care and attention to detail given to its specially developed low‑latency software is also praiseworthy. On the other hand, I've reviewed various rugged rackmounted PCs that provide more processing grunt for considerably less money. However, the more I used it, the more I fell on love with its straightforward plug‑and‑play philosophy. Ultimately, you pays your money and takes your choice, and the Receptor's popularity among professional musicians is testimony to its success, with some even buying three or four for their gigging rigs. I even began to forget that the Receptor 2 was a PC, and of course this is the ultimate compliment you can pay it. If you fancy an all‑in‑one keyboard workstation incorporating a custom PC running Windows, complete with integral 15‑inch touchscreen, Open Labs' rather more expensive Neko range (www.openlabs.com) is well worth a look, as is the forthcoming Lionstracs Groove X6 running Linux Kubuntu (www.lionstracs.com). 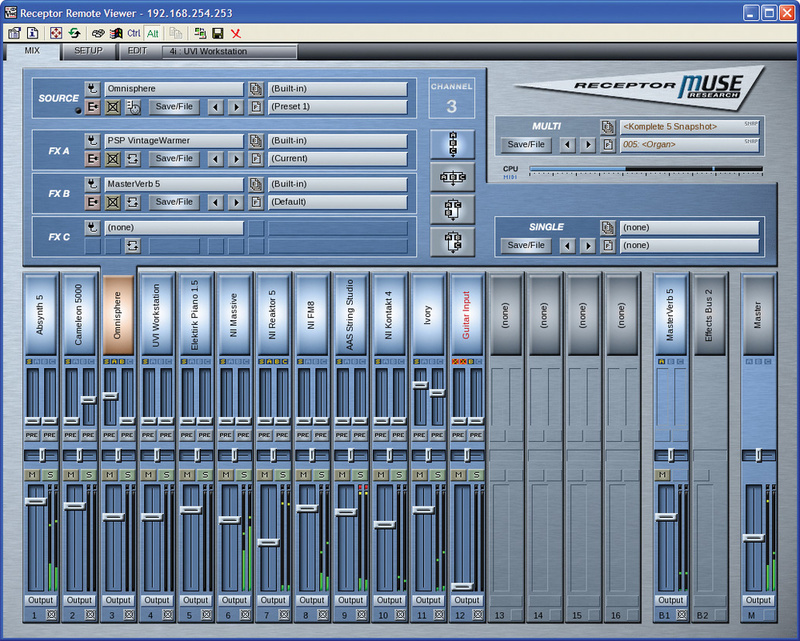 Feeltune's Rhizome (www.feeltune.com) is yet another approach being released later in 2010, combining a PC running stripped‑down Windows XP with a hardware sequencer, mixing desk and control surface. A more affordable alternative for those who simply need a stand‑alone VST Player for foolproof gigging is SM Pro Audio's V‑Machine (www.smproaudio.com), with a 1GHz CPU, 512MB RAM and 1GB of flash memory — more than sufficient for some instruments and effects live if your requirements are modest. Muse Research are also now offering a similarly specified, 2U, half‑rack MuseBox device with 1GB or 2GB of RAM and 4GB of Flash storage. If, on the other hand, you already have a roadworthy computer but want to run a minimal VST host designed for soft-synth gigging, take a look at Brainspawn's Forté 2.0 (www.brainspawn.com). For the vast majority of musicians who fall between these two extremes, and who want a more versatile replacement for a rackmount synth that can run lots of VST Instruments and effects, the basic Receptor 2 (£1723$1999) could be just the job. It's also available with NI Komplete 6 pre‑installed( £1818$2499), in a stylish metallic green/black case, and as the Total Workstation 2 Rack, featuring IK Multimedia's SampleTank and red/black livery (£TBC$TBC). Owners of the original Receptor can upgrade to either the Receptor 2 Pro or Pro Max performance (but not the standard Receptor 2 at the moment). Unfortunately, your hardware has to be returned to Muse Research, and since you're getting a new CPU, RAM, motherboard, hard drive and chassis, this is more a replacement than an upgrade, and priced accordingly. Prices vary depending on what power supply is in your current Receptor, and whether or not you want to retain your existing front panel/knobs/display (for a slightly reduced cost). Full details can be found at www.museresearch.com/receptor2_upgrades.php. The Receptor arrives bundled with hundreds of presets that can be unlocked when you register the device at Plugorama (www.plugorama.com), a web site run by Muse Research that hosts all the latest info on the Receptor's compatibility with VST Instruments and plug‑ins. Muse Research have also taken over the popular KVR forum (www.kvraudio.com), where you can now specifically query their extensive product database to find out what third-party products are officially compatible with the Receptor, user installable, or known to work but unsupported. Most PC-format instruments/effects do run on the Receptor, but copy‑protected ones do need to be 'Receptorized' and have their licenses stored on an iLok dongle (although this does look quite vulnerable sticking out of the back of the Receptor). 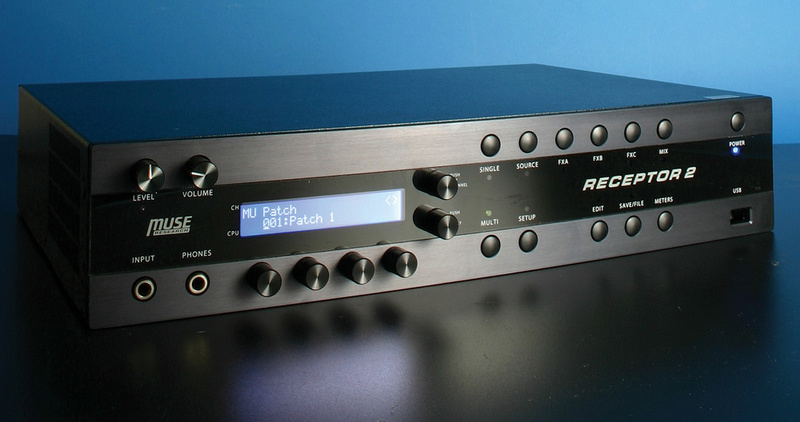 Early Receptor 1 adopters faced a lot of frustration waiting for these compatible versions of their favourites to appear, but many issues have now been resolved. Support for Spectrasonics and Native Instruments products was, for instance, greeted with grateful enthusiasm by many people. However, some products now compatible with the Receptor 2 remain incompatible with the Receptor 1, which has annoyed existing users, some of whom feel forced to upgrade. Rock‑solid, low-latency operation with excellent audio quality. Far more rugged than a laptop for live use. Solid-state drive option runs cooler and quieter than standard hard drives, and is almost totally immune to stage vibration. eSATA support not yet implemented in software. The Muse Receptor 2 provides a huge hike in performance over its predecessor, and continues to offer the gigging musician a rock‑solid alternative to risking a normal computer in a live situation, albeit at a premium price. Academia Ltd +44 (0)8456 120 118. Muse Research & Development Inc +1 650 326 5400. Muse Research Receptor 2 Pro Max, system version 1.8.20090821. PC with Intel 2.4GHz dual‑core processor, 2GB Corsair RAM and Windows XP with Service Pack 3.